This roll- on works really well. I like the fresh scent and I it definitely does the job as stopping sweating. It's very effective and I really enjoy using it. It doesn't leave any residue like other deodorants can do and is just handy to pop into a bag. This roll-on is a real life-saver for someone like me who sweats really easily! I always pop this on at night rather than the day just because I prefer using an aluminium free deodorant during the daytime. Additionally, this deodorant is easily accessable (most Unichem/ Life Pharmacies stock it) and is very affordable. Tips: This anti perspirant contains aluminium zirconium which is effective in tackling sweaty underarms & BO. If you are susceptible to clogged pores, pop this anti perspirant at night, then follow it up with an 'aluminium free' deodorant in the morning. Works like charm! I picked this deodorant up at the supermarket when my usual deodorant wasn’t there- and I’m so glad I did! Tha deodorant really does the job of keeping me feeling fresh and it really lasts. I walk a lot and in the summer need something to protect against getting sweaty and this does really work. It’s so affordable and you can pick it up from your local supermarket. It’s a really good product that you wouldn’t really expect from the plain packaging. I will continue to re purchase. Simply the best anti perspirant out there. Leaves my armpits dry, even after a jog or on a hot day. No wetness, no smell. Better than the Rexona 48 hour anti perspirant. Tips: Shave your armpits for maximum effectiveness! I needed a really good deodorant and nothing worked for me so I decided to try a mens one since maybe they would be more "hardy"? Well, this one WORKS! AND I don't smell like a man! I get the unscented and it works better than the woman's version (for me). It helps me to not sweat as much and I don't get BO. Definitely recommend. This is the only deodorant I use now. I use the one that is supposed to be for men and is unscented. I have really sensitive skin in my armpits and other deodorants can make my skin sting but this doesn't. I find it works really well as an antiperspirant too. Would recommend to everyone! I was on the hunt for a deodorant that did the job, smelled nice, was affordable, and didn't test on animals. Let me tell ya, it wasn't an easy process! BUT THEN I stumbled across this brand, did some research, and discovered that they're cruelty free AND super effective! 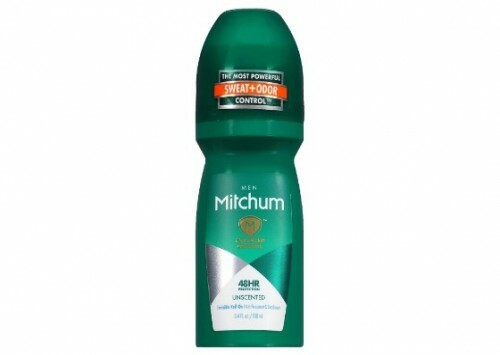 Mitchum deodorants have been my favourites ever since. I alternate between using the Shower Fresh and Powder Fresh scents, and they're both lovely. This deodorant is the most effective I've ever used - it takes a really, really hard workout for me to break a sweat while wearing this. It has become the go-to roll-on for myself and my fiance for the past couple of years now, and I can't see that changing anytime soon.